Late last summer, following her husband’s job loss in Texas, Maria relocated her family to Richmond. When Maria tried to enroll her four kids in school, she learned they needed back-to-school physicals and updated immunizations before they could attend school. 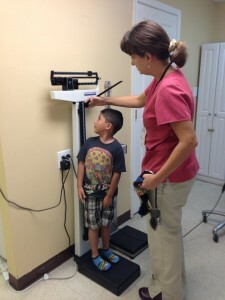 The first available appointments were in mid-October, six weeks after school started. Renee was caught in a similar limbo. She was in the process of applying for federal aid, but until that application was approved, this Richmond mom was unable to schedule back-to-school physicals for her two girls, 5 and 7. And school was about to begin. Uninsured and low-income families face a myriad of barriers to getting the physicals and immunizations required for school attendance. Cross Over Ministry aims to remove these barriers. “Cross Over’s Back-2-School Community Immunity program is a strategic initiative to aid those in need as the back-to-school rush reaches a crescendo. Vaccinating children ensures the well-being of the entire community and facilitates the educational process with the timely entrance into school,” says Daniel Jannuzzi, MD, medical director at Cross Over Ministry. Established in 1983, CrossOver is the largest free clinic in Virginia, with three locations in the Richmond area. CrossOver offers its patients a full spectrum of health care services including primary, dental, eye, obstetric, and specialty care. CrossOver also provides medications, health education, and HIV testing and treatment. By offering an integrated system of care, CrossOver helps its patients manage their conditions so they may lead more productive lives. According to Dr. Jannuzzi, the staff at CrossOver continually searches for innovative ways to care for those in need. The clinic’s Community Immunity initiative, slated for late August, has been offered in various forms since the nineties. In 2009, CrossOver attended to 100 uninsured children. Last year marked the first time the event was held in all three of the organization’s clinics, the first time immunizations were administered, and the first time dental and eye exams were offered. This year, the staff at CrossOver expects to see at least 500 patients – all school-aged children, up to 18 years old, who are uninsured or on Medicaid. They will receive back-to-school physicals, immunizations, dental screenings, and eye exams to ensure they start school on time and are able to participate in school sports. Depending on donations from the community, each child will also receive a backpack of school supplies.